Last week I tweaked something in my arm, and a substantial rest, of at least several days, was in order. This situation may have had something to do with the ladder, and swimming. We’ve had an enormous run of hot weather (now changed, I’m happy to say) so I was really hoping to do some more swimming, but minus the ladder. Meantime, there is a narrow cove around the corner from the spot where I was anchored. At high tide this island is two islands, and at low tide the two are joined by a substantial sandbar across the west end of the slot between the islands, and they are also almost connected by a more moderate sandbar across the east end of the narrow channel. A shallow pool is formed in the middle between the sandbars, during each low tide. I had my eye on that spot with the pool. A boat with a long shallow keel, like this one, is well-suited to letting the tide go out underneath it, so that it rests about halfway over on its side on the sand or the mud. I had done this by accident last year, but it had been on my mind to try it again with more planning. One of the good things about letting the boat go down on the bottom is that the low side of the cockpit allows for stepping right off the boat – no ladder needed! And another good thing is that you don’t get a lot of company nearby because of the shallow water, which is perfect in a crowded summer bay. Not every sandbar or muddy cove is ideal for doing this drying out thing. It’s important that when the boat is making the transition between floating and not floating that there are no big waves or boat wakes heaving it up and down, causing hard landings. That cove at Little Whaleboat is so inviting because of the two sandbars and because there are also protecting outer rocks at the entrance to the cove. While one is floating, virtually no boat wakes make it all the way inside. Heavenly. As I’m writing this in Potts Harbor, it’s boat wake city, reminding me of just how special a quiet piece of water is! For all these reasons, going into the inner cove at Little Whaleboat looked like the perfect thing to do – out of the wakes, not to mention any actual wind waves, absolutely, stunningly beautiful, and an ideal setting for experimenting with letting the boat go down on the bottom. And besides, it really was time to stop for a little while. The tide was low around noon, so at about 10 in the morning it worked out just fine to pull up the anchor and go around the corner. The lobster boats were hard at it, so there was loads of inspiration. Just that little sail made it very apparent that stopping to rest was pretty much the only choice – nothing like necessity to help in a decision-making process! So into the cove it was, anchored in the deepest spot I could find in what was going to be that central shallow pool. It was a lot of fun to watch the boat settle, and even more to step off into 6 inches of water. Nice sand would have been a treat – but why be fussy! The only tricky part was the shells mixed in the soft mud. I tried water shoes, but the ankle-deep mud just sucked them right off, so it was back to bare feet. I have the knicks to prove that boots would be a good idea. My friend Anke, who sails, and is familiar with grounding out for extended periods of time, in southeast Alaska, brought up the subject of boots last year when I was talking about doing stuff like this, and she was so right. I’m going to work on that. In the meantime, nearby there was just enough water to swim/float, which was a nicer way to get around. When everything was once again upright the whole process seemed pretty doable, so I decided to stay. The tide is low roughly every 12 hours, so at midnight we did it all again, minus the swimming, and with the second anchor keeping the boat from coming down where it shouldn’t. The interior of the boat was rearranged so that nothing would fall, and my berth had every soft thing available – pillows, fleece blankets, and most of the clothing – moved into the long, low corner between the berth and the side of the boat, in order to make a surface that was reasonably level while everything else was over at 30°. As it turned out, I did this for three days and three nights, through six cycles of low tide. It was pretty much a clinic on letting the boat dry out. Anchors were adjusted, small but undesirable rocks were avoided with further anchor adjustment, interior stowage of things prone to falling was refined, the nicely exposed bottom of the boat was cleaned, and my case of nerves about going through this particular exercise was vastly reduced. By the last round, low tide #6 in the middle of the night, I thought it had really been quite enough. But the issue was more that I didn’t want to go through the production, rather than that I was worried about it. What a nice change! And during that last round I tried something different with the berth arrangement that worked particularly well, and slept through two hours of the boat being down. The moon had gotten full over these three days, making for much higher and lower tides, so the last round left the boat truly high and dry, and over on its side for more like four hours rather than the original two. But I was sleeping for a good part of that, which was just great. All in all this exercise was a success. I did set out to try the beaching legs on the second day – these are special boards that go in brackets on the sides of the boat, and if they work, the boat stays level, resting on its keel and kept from tipping over by these stilt-like legs. They use these in Great Britain quite a lot, and I’ve been looking for the perfect opportunity for a test. Sadly, the special boards, and probably the brackets themselves, have all swelled up, what with being out to sea and all, and the boards were too tight to go into the brackets. But I learned a lot about trying to set the legs themselves, and about details to do with the square plywood boards that go underneath the legs so the legs won’t sink in the mud. Now I’m full of ideas about how to make another version of legs, and am looking forward to getting to try this again. There’s nothing like being over at 30°, repeatedly, to inspire further thought on keeping the boat level! There are some interesting details that came up through all those drying out repetitions. Twice, the boat didn’t go over so far. When it was resting on its side it was at something more like 18 to 20°. Because of the anchoring arrangement it came down in somewhat different locations each time, and must have found the perfect spot to let the keel down a little lower, and to support the side of the boat a little higher. This is consistent with when I went over by accident last year, when it was at more like 15°. Looking at the photograph from this current experience, (likely to be added later, when I have a stronger Internet connection) one would think that if the boat was lying toward the beach rather than away from it that all this would be explained. But it’s not so simple – on the last night it worked out to have the boat go down toward the beach, but it was at its familiar 27 or so degrees regardless. 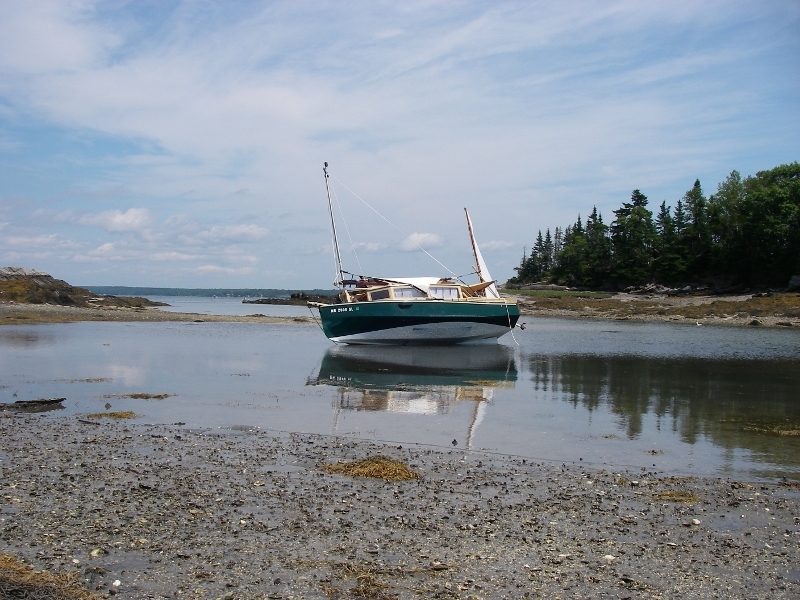 If a boat beaches in a storm, it’s crucial that it lies down toward the beach – otherwise, when the tide comes back the waves will come toward the low side and the boat can be flooded before it has a chance to come up. There are sad stories about this. In this little cove I wasn’t so worried, and indeed wanted to see if lying away from the beach would make much of a difference. As it turns out, because of the shape of the hull this boat begins to float beautifully very early in the process of coming back up, so it doesn’t feel like a worry in a protected setting. But it was nice to confirm that. Either way, the bottom of that little pool is pretty flat, so it wasn’t such an issue. On more of a slope I’d be careful to encourage the boat to go down on the preferred side. Another of the interesting bits that came out of all this is how mobile the boat is even when you would think that it was down for the duration. In one of the daytime rounds, when I really wanted the boat down on its port side so I could clean the starboard hull, I waited to do something in the cockpit that involved me moving onto the starboard side of the seats, staying on the port side until after it seemed like the boat had settled with that side down. As I finally scooted over to sit on the starboard bench, up came the boat, and it settled over to starboard! I quickly zipped back to the other side and miraculously up the boat came again and back down to port. This was a real surprise given the angle of heel. I don’t have a measurement for that, but it was fairly significant. It’s good information to have in case of a less-planned situation, when one might assume that it isn’t even worth trying. It’s a real surprise to feel the boat come right up like that – it doesn’t match one’s intuitive sense of the physics. Which brings me to another funny thing about boats over on their sides. For one thing, it can make you feel really seasick, which is ironic considering that the time when you feel most seasick is when the boat is solidly immobile on the ground. But it’s like a funhouse – one of those roadside attractions when you drive across the country, advertised on billboards for 100 miles beforehand, saying come see the Anti-Gravity House. All the angles are wrong, and marbles (appear to) roll uphill. 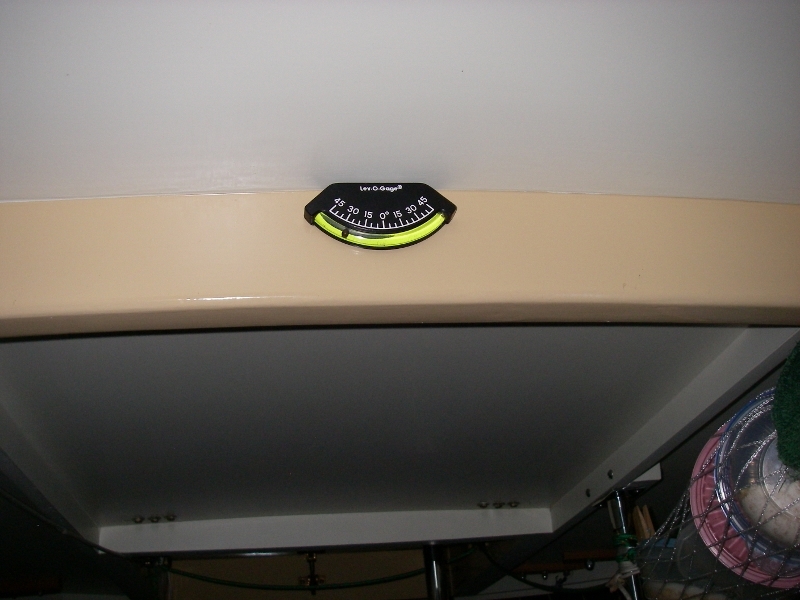 With the boat on its side, most especially inside the cabin, and even more especially in the dark at night, visual cues are completely skewed. The curtains hang at the most bizarre angle, and it takes time to feel for where to brace yourself to actually move around. The second night I rolled all the curtains up beforehand, and put away the hanging washcloth and towel, which made things look a lot less alarming. It really felt like being on the set for a supernatural movie. Something about the stillness of being aground really contributes to this – it’s never felt like an issue while sailing, even when the angles can get just as severe. For one thing, in such a small boat, while sailing it’s always a very changeable situation, though I imagine on a big keelboat it could be different. Either way, solid on the ground and the curtains hanging like something in Star Trek took real getting used to. It’s extraordinary how visual cues on familiar objects are so important to one’s sense of equilibrium, as well as to one’s sense of “everything being okay.” The brain science folks must have a field day with this, but I really didn’t expect it. It’s as if going on the ground turns the boat into a house – rooted to the earth, suddenly it matters desperately that vertical objects stay vertical, and that frames of reference maintain their place. It was literally impossible, for me, to find the true horizontal plane just by feeling for it. After awhile, sometime into all those repetitions, I spent some time entertaining myself by eating pistachios in the dark with the cabin light, dropping the shells one by one, watching their angle of fall to see the line of true vertical. It still makes my head go buzzy just thinking about it, but it was an absolutely fascinating experience. For now, I’m thoroughly enjoying sleeping through entire nights with a regular, right side up boat. But I’m glad to have expanded my familiarity with going aground. It’s a useful thing to be able to do for so many reasons: access to quiet coves; safety in big storms, grounded out up a quiet creek; access to the bottom of the boat for cleaning or repair; and, like my friend Dave first described it, a route on and off of the boat without a ladder – like a kneeling camel. A friendly camel, who really looks after you. Seeing the picture of Auklet on its side, made me want to run out with my bucket of bottom paint! Perfect position to reach the spots under the bunks that didn’t get paint.